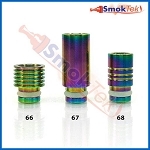 These Stainless Steel drip tips have a great look to them and will enhance the look of any personal vaporizer you use! They are wide bore, with a hollowed-out interior, making them especially well-suited for dripping. Fits most 510, 901 and KR808 atomizers. Q: How do I know what this will fit? Thank you for reaching out to us! Excluding tanks with proprietary drip tips, such as the TFV8 series, the Wide Bore Stainless Steel 510 Drip Tip will fit tanks that accept 510 drip tips. 510 drip tips have no threading; they just pop one and off, and they're held in place by the O-ring. 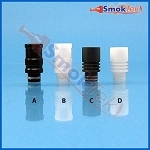 CE4-style drip tips have threading. 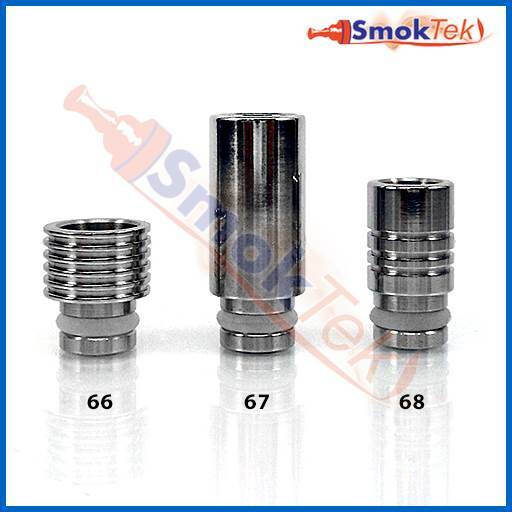 So, if the drip tip on your current tank does not have threading, the Wide Bore Stainless Steel 510 Drip Tip should work great. 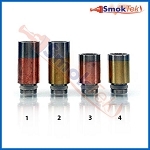 Q: Will style 66 drip tip, 14mm x 8mm fit a Smok Stick Prince V12? Thank you. A: No this will not fit. Sorry.